It must say something about the Club as a whole when a bunch of our old players, other teams' players and even Olympians come and train with us. In the recent past we've seen Thierry Henry, Sol Campbell, David Beckham, Aliadiere, Mo Farah, Matthieu Flamini, (I seem to remember Ljundberg there for a minute?) and now we've got perhaps the best looking mortal of all time gracing the lush pastures of Shenley Training Ground. More than a couple of those names have come in quite handy, partly due to lack of squad depth and impeccable timing. Sol Campbell played a big part in the end to our 2009/10 season, when we were short on defenders and battling to finish in the top four. Thierry Henry similarly came in during his break from new club New York Red Bulls at a time when it made perfect sense for him to sign a quick loan deal and get some minutes with us. He even ended up scoring a couple of winning goals for us and earned us some valuable points. Mattieu Flamini signing with us this year was initially met with some raised eyebrows. Due to our inactivity in the transfer market, people can't be blamed for thinking it was a panic signing born somewhat out of convenience. But he's not only filled holes where we were a little light due to injury, but he's come into the team, shouting, pointing and generally bossing the midfield around like he used to a few years back. A damn good signing. Whether Wenger has an uncanny knack for signing ex-players when they're out of contract/on loan or just flat out good luck, I don't know, but it's proving a consistently successful gamble. 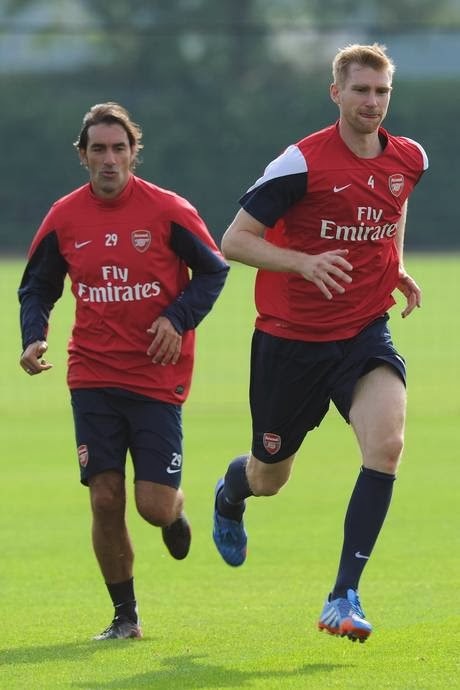 Robert Pires is 40 years old.... so I doubt he's going to be featuring in the Premiership again any time soon, but I seem to remember the same being said about Campbell, Henry and even Flamini. They're too old, too injury prone and can't hack it in the Premiership anymore. To see the dreamy one stretch his perfect calves and jog onto the pitch at the Emirates wearing the famous Red & White again, with the current form we're in.... would be incredible. On the other hand, I don't want to see him get embarrassed. I've got great memories of him gliding across the pitch, flicking his long, flowing hair as he ran, and I don't want those memories ruined. He most recently featured, professionally with Aston Villa back in the 2010/11 season and wasn't particularly impressive. But I suppose you have to ask why he's training with us? Perhaps he's just keeping fit? Maybe he's eyeing up a coaching role? That seems the most likely, especially after Wenger stated that he comes to training every now and then and is constantly giving advise to current players. I would take Bob as a coach any day, and it must be great for the young (or old!) players in the squad to be able to pick up ideas from one of the greatest creative midfielders of all time.